Netball is one of the most popular sports in New Zealand, with more than 300,000 people participating in the game annually. The 2019 season is well underway, bringing with it countless exciting moments for players and spectators alike. To the uninitiated, netball might seem like a fairly gentle, non-contact sport but - as players know all too well - this couldn’t be further from the truth. The jumping, pivoting, pace and inevitable collisions involved with netball make it an intensely physical sport and, unsurprisingly, injuries are common. The good news is that there are a number of things you can do as a player to reduce the risk of injury. Read on to learn more about some of the most common netball injuries and what you can do to prevent them. Ankle sprains are one of the most common sports injuries. An ankle sprain occurs when the ligaments that hold your ankle bones and joints together are stretched or torn. In netball, this typically happens when you land awkwardly, change direction quickly or step on another player’s foot. There are many exercises you can do to reduce the risk of an ankle sprain. Strengthening exercises such as calf raises, lunges and single-leg half squats can help build strength in the surrounding muscles, ligaments and tendons, while standing on one leg can help develop balance and your proprioceptive sense. Remember that your choice of footwear also plays a key role in preventing ankle sprains and other lower body injuries. Patellar tendonitis, otherwise known as jumper’s knee, is inflammation of the patellar tendon, which connects your kneecap to your shinbone. When you jump and run, the patellar tendon and the surrounding muscles help extend your knee and propel you into the air, and absorb the force of landing when you come back down. If these muscles are overused, or if you have a muscular imbalance or poor running and/or jumping mechanics, you may develop chronic pain and tenderness around the knee. Preventing patellar tendonitis involves regular stretching and muscle building exercises. Stretching your quads, calves and hamstrings alleviates tension in your muscles and reduces stress on the patellar tendon. In addition, movements such as eccentric squats on a slanted board, single leg glute bridges and clamshells can help strengthen your quads and hamstrings and reduce the risk of injury. Most commonly associated with running, shin splints also affect thousands of Kiwi netball players. Shin splints are caused by stress on the tibia (shinbone) and the connective tissues that attach the muscles to the bone. Repetitive stress causes the muscles in your legs to swell up, which puts pressure on your tibia and eventually leads to pain and inflammation. Preventing shin splints revolves around warming up properly before your games and training sessions, and taking the time to fully stretch your hamstrings and calves. It’s also important to avoid suddenly increasing exercise intensity and giving your body plenty of time to rest in between bouts of physical activity. Exercises like calf raises, donkey kicks, hip thrusts and clamshells are excellent for building strength in your calves and hip muscles and preventing shin splints. The rotator cuff is a group of muscles and tendons that surround the shoulder joint and allow the shoulder to move. Rotator cuff injuries in netball are usually caused by the repetitive movements of passing and shooting. There are many exercises that can help strengthen your rotator cuff and reduce the risk of injury. Band pulls, band rows and band internal and external rotations are all excellent exercises that can be used to build strength without applying excessive pressure to the shoulder joint. While there’s no silver bullet for injury prevention, taking a proactive approach to your health and wellbeing can do wonders for keeping you safe on the court. In the event that you do sustain a sports injury, Dynamic Physio is here to help you treat the issue and provide you with the insight you need to minimise the risk of injuring yourself again in the future. Have you suffered an injury playing your favourite sport? We are fully ACC registered - book an appointment today and we'll get you back in the game. If you’re undergoing surgery for a musculoskeletal issue, it’s easy to see the operation as the final hurdle in the recovery process. After you’ve come out of the operating room and had a few days of rest, you’ll be fixed and ready to go, right? Unfortunately, it’s not quite that easy. In fact, surgery is usually just the first step on the road to recovery. Depending on the details of your operation, there’s a good chance your doctor will recommend following a physical rehabilitation plan to get your body back up to speed. But the rehabilitation process doesn’t happen overnight. It often takes months of regular physiotherapy to fully restore your strength, mobility and flexibility. One of the key advantages of rehab is that it supports and speeds up the healing process so that you can get back to your usual activities. Physical therapy can help prevent scar tissue forming, reduce loss of muscle mass and increase your range of motion, all of which support the body’s ability to heal. Some parts of the body are vulnerable to repeat injury. For example, about 20 percent of people who undergo ACL reconstruction will suffer a second ACL injury within 24 months of returning to sport, according to research published in the Orthopaedic Journal of Sports Medicine. Post-surgery rehab is an opportunity to identify and correct the imbalances that lead to injury. Rehab is critical for restoring mobility and helping you move fluidly and without pain. During rehab, your physiotherapist will work with you to devise a strengthening program that builds up the supporting muscles that surround the affected joint, and provide you with exercises to gradually increase your range of motion. In addition, if you have undergone major surgery that affects your balance (say, total knee replacement or hip fracture surgery), rehab can help you relearn how to move safely and confidently. What happens if you neglect your surgery rehab? As noted above, physiotherapy directly supports your body’s natural healing abilities and can help speed up the recovery process. If you don’t follow through with your rehab, you may increase the risk of developing scar tissue, be less able to maintain muscle mass and lose flexibility in the affected joint. All of these factors hinder your recovery and prevent you from resuming your normal day to day activities. The last thing you want after having surgery is to re-injure yourself and go through the recovery process all over again. In a study from the University of Minnesota, researchers found that patients who did not follow a physiotherapy exercise plan were 11 percent more like to reinjure their ankles than those who followed a rehabilitation program. A good physiotherapist can provide expert insight into rehab exercises that are tailored to your specific injury and unique anatomy, and show you how to perform them safely. They also offer guidance as to which activities and movements are appropriate for where you are in the recovery process so that you don’t push your body into anything it’s not ready for. It’s vital to follow up with physiotherapy after any type of musculoskeletal surgery, and it’s just as important that you stick to the rehab plan right the way through. While it can be difficult to adhere to a rehab program for months on end, it’s ultimately the best way to support your body’s natural healing processes and help you regain any strength and mobility you might have lost as a result of your injury. If you’ve had surgery and you’re looking for a physio to support you through the rehabilitation process, feel free to give us a call today on 09 476 2166 or book an appointment online. Sport is close to the heart of New Zealand’s identity. It shapes our culture, inspires our youths, and we’re fiercely proud of the athletes, our homegrown warriors, who go on to represent Aotearoa on the international stage. Unfortunately, how we express our respect and appreciation for our athletes varies tremendously between genders. Kiwi female athletes are consistently paid less, receive less media coverage and are much more likely to be the subject of bullying compared to their male counterparts. What’s responsible for this trend? And, more importantly, what are we doing as a country to fix the issue? We’ve managed to narrow the pay gap in many of our major industries, but the same cannot be said of our sports teams. Female athletes simply don’t command the same salaries of male athletes. Top players in the Silver Ferns, which is far and away the most popular female sports team in the country, earn about $130,000 - not a paltry sum, but a far cry from the salaries paid to our leading male sports teams. Many of the All Blacks, for example, command salaries of well over $500,000, with captain Kieran Read being the first All Black to crack the $1 million salary mark in 2016. There’s also a huge difference in terms of media coverage. News stations tend to gloss over recent developments in most female sports teams and - with the exception of the Silver Ferns - you’re often hard-pressed to find a TV station broadcasting the matches of your favourite female athletes. A Wellington-based data company recently set out to calculate how New Zealand Olympic and Commonwealth Games athletes are represented in the media. After analysing 42,000 news articles, they found that male gold medallists are mentioned more than twice as often in the media as female gold medallists. Of course, it’s not all about the fortune and fame. It’s also about how women in sport are treated. Over the last few months, we’ve seen a number of damning reports from various sports teams regarding the behaviour of coaches and managers. In July, Andreas Heraf resigned as coach of the Football Ferns following complaints of bullying and intimidation. Just a month later, Hockey New Zealand confirmed it would be launching an independent review into Black Sticks team culture after a number of national players spoke out about coach Mark Hager’s behaviour and other issues within the team. Kiwi sportswomen face more than their fair share of challenges, but that hasn’t stopped them from becoming incredibly successful athletes. Just look at what they achieved in 2018. At the Commonwealth Games, Dame Valerie Adams made an amazing return to form and won a silver medal, the Black Sticks Women nabbed a gold and swimmer Sophie Pascoe added two more gold medals to her collection. Meanwhile, the Black Ferns Sevens won their second straight World Series tournament, 16-year-old snowboarded Zoi Sadowski-Synnott scooped a bronze at the Winter Olympics, the Football Ferns qualified for the 2019 FIFA Women's World Cup and the New Zealand U-17 Women finished third at the U-17 FIFA World Cup. And that’s just the tip of the iceberg - there really have been too many great sporting moments to list them all here! We might have dropped the ball when it comes to gender equality in New Zealand sport, but we are tentatively moving in the right direction. In May 2018, New Zealand Football made headlines after making the decision to give all its international athletes equal pay, prize money and travel privileges. And a few months earlier, New Zealand Rugby announced it would start paying the Black Ferns a (modest) salary. The government is also making moves to inject some much-needed money into levelling the playing field. In October 2018, Jacinda Ardern announced the government would be investing $10 million over the next three years to overcome the inequalities for women in sport. “Showcasing our inspiring women sporting heroes will help drive women and girls participation,” explained Ardern. “Achieving pay equity for our top female athletes and a new journalism prize for coverage of women’s sport will help to raise the profile of our top women athletes. New Zealand has a rich history of championing equality and women’s rights, but whether or not we can achieve parity on the sports field remains to be seen. This year we’ve seen the spotlight shine on certain issues within New Zealand sports culture, and we can only hope that it paves the way for positive change in the future. Not an elite athlete yourself? No worries! we treat everyone at Dynamic Physio. Book an appointment today by giving us a call on 09 476 2166 or complete your booking online. Acupuncture is a type of treatment that focuses on improving health and wellbeing by bringing balance to the body through the use of very fine needles. Acupuncture has a rich history dating back thousands of years; today, it’s practiced by doctors and specialists in major hospitals throughout the world. Despite its widespread use, there is still some confusion surrounding acupuncture. We sat down with Dynamic Physio acupuncturist James Suh to learn more about the ancient practice and its place in modern medicine. Acupuncture is an important part of Traditional Chinese Medicine. It is a form of treatment that looks to bring balance to the body by stimulating acupuncture points that lie within channels called meridians. Pain is presented due to blockages or stagnation within these meridians. These issues are commonly caused by external factors such as physical trauma, certain climate extremes such as cold, heat or wind, and internal factors such as stress. 2. What is your approach to acupuncture treatments? As a traditional acupuncturist I am always looking to develop my skills and knowledge, which has led to the addition of more modern techniques such as dry needling and the inclusion of motor points. Motor points are specific areas that have the highest excitability (the largest nerve supply) of the muscle, which can be manipulated to relieve tension and pain. As a clinician, I am a firm believer in looking for and treating the root cause of the condition. Taking a holistic approach to treatment is the best way to achieve long-term relief. 3. What are some common conditions that you see regularly? I treat people of all ages and backgrounds, ranging from fit athletes who need regular tune-ups, to stressed workaholics and aged adults looking for a boost of energy. The conditions I most commonly see are musculoskeletal injuries of the neck, shoulder, lower back, knee and ankle. I have also had good results with treating non-musculoskeletal conditions such as stress, low energy, and poor sleep and digestion. 4. What are some of the common myths of acupuncture? Painful: A lot of people have the idea that the needles used in acupuncture feel like the injections we get from doctors. Acupuncture needles are actually very fine (finer than human hair, in fact!) and 90% of the time a patient won’t even notice the needles going in. Doesn’t work: Acupuncture has been used throughout history for thousands of years and is widely integrated in major hospitals in Asia and the US. There are many studies on the effects of acupuncture, including its ability to elicit the release of natural pain-relieving chemicals like endorphins and anti-inflammatory responses. Doctors don’t recommend acupuncture: There are many doctors and specialists all over the world within various fields of medicine who prescribe and support acupuncture. I personally have come across many doctors and specialists who have a strong belief in acupuncture’s therapeutic value. Every clinician has their own belief system around different treatment modalities, just as they have different approaches to their own treatments as well. I believe it all depends on their personal experiences. Regardless of our beliefs, we mustn’t forget that we all have the same goal of helping our patients! 5. Lastly, what made you decide to get into acupuncture and what has your experience been like so far? I was drawn to acupuncture out of a desire to help people, and I love what it has brought me so far. It has led me to countless new and exciting experiences and opportunities, and introduced me to amazing people from all walks of life. It may sound cliché - I think everyone in the health field has probably thought this at some point - but the biggest reward is knowing that you’ve had a direct, positive impact on the lives of your patients. A big goal of mine is to continue to learn and improve my clinical skills and serve in medical missions all over the world. If you’re dealing with a niggly sports injury, ongoing pain or are generally feeling run down, there’s a good chance that acupuncture could provide some relief. To book an appointment with James, give us a call today on 09 476 2166 or fill out our online appointment request form. We’re not quite sure how it happened, but we’re well and truly into the final stretch of 2018. That means holidays, sunshine and Christmas festivities are just around the corner, but it also means you’re probably super busy at work tying up all the loose ends before the holiday season arrives. Working long hours and dealing with high-pressure situations in the final end-of-year rush can be incredibly stressful, which can take its toll on your body in a number of ways. Being able to spot these symptoms and stop them in their tracks is crucial for maintaining your physical and mental wellbeing. Psychological stress can express itself with many different physical symptoms, with neck pain being one of the most common. When you’re stressed, you tend to subconsciously tense the muscles in your neck and upper back. Over time, this strain can lead to neck tension, headaches, and pain in your shoulders and back. Stress can also make you more sensitive to pain. Little niggles that you wouldn’t notice in ordinary circumstances are amplified and can feel downright painful when your stress levels are high. When you’re stressed, your body responds by releasing cortisol (otherwise known as the stress hormone), which makes you breathe faster in order to deliver oxygen-rich blood to the organs that need it most. Breathing quickly and deeply can cause shortness of breath, particularly if you have an existing respiratory condition such as asthma or emphysema. Once you start feeling short of breath, you may become nervous or anxious, which tends to make it even more difficult to breathe. If left to go unchecked, this cycle can lead to a panic attack. Stress can have a significant impact on the quality of your sleep. If you’re preoccupied with work projects you may find it difficult to unwind when you get into bed, which can affect the duration and quality of your rest. A lack of sleep can make it more difficult to focus on tasks during the day, and may make you feel more irritable with friends, family and colleagues. Stress can magnify postural issues that many people - particularly office workers - deal with on a daily basis. How? Well, as noted above, stress can contribute to upper body and cranial pain, which people tend to compensate for by adjusting their posture in a way that may be harmful or unnatural. Poor posture can potentially lead to long-term back and neck problems, which can become additional sources of stress. Looking for an effective way to deal with the end-of-year chaos? We’re here to help. Come down and see your physiotherapist and/or our expert acupuncturist, James, who will help put together a strategy to keep you free of stress and pain as we move into the holidays. Give us a call on 09 4762166 to book your appointment online today. At 32 years old, Usain Bolt is fairly long in the tooth in terms of professional athletes, but that’s not stopping the world’s fastest man from pursuing his new goal of becoming a professional footballer. Over the last few months, the eight-time Olympic gold medalist has been on trial with the Central Coast Mariners, a New South Wales football club that competes in the A-League, Australia’s primary football competition. Can Bolt actually play football? When Bolt first announced his intentions of playing football at a competitive level, he was met with a fair bit of scepticism - and perhaps rightly so. Football is a notoriously technical sport, and it seemed unthinkable that a newcomer, regardless of their athletic background, could jump right in and play with the big boys. Now that we’ve seen Bolt on the pitch a few times, it’s clear that he lacks the polish of the more experienced players, but he has demonstrated that he can just about hold his own on the football field. Earlier this month, Bolt scored twice in a pre-season friendly to help his team secure a 4-0 win over Macarthur South West United. After a shaky start, which included some clumsy touches on the ball and copping a wayward boot to the groin, Bolt eventually found his rhythm, scoring a scorcher off his left foot in the 56th minute and taking advantage of an MSWU defensive blunder to score again in the 67th minute. Will Bolt sign with the Central Coast Mariners? The Mariners have offered Bolt a contract, but it’s not clear at this stage if he will accept the offer. Reports indicate that the contract is worth about $150,000 - a respectable amount for an up and coming footballer, but a drop in the ocean for Bolt, who allegedly takes home about $45 million per year in endorsements alone. Bolt’s management team had originally discussed a $3 million contract, which simply won’t happen without significant funding from a third party. "There were some marketing conversations about contributions towards attendances at games, appearance fees, if you like. But as for funding him as a footballer, then [Football Federation Australia] has been consistent in that they won't fund him. That won't change." Bolt is expected to make a decision in the next few days. Usain Bolt might be able to make a flawless transition from sprinter to footballer, but it’s not that easy for the rest of us! Taking up a new sport can increase the risk of injury, so if you’re thinking about picking up a new sport as we move into summer make sure you come in for a warrant of fitness… you’re no Bolt! Winter is here. The weather is rubbish and it’s frosty outside. It’s also cold & flu season, with many people falling ill.
It’s tempting to skip exercising on days like this when it’s dark and cold outside. The temptation is even greater if you aren’t feeling 100%. If you are sick, how do you know when to push through and when to take a rest day? When you are ill, your body is already under a lot of stress so making it do more work may not be the best idea. The general consensus is that if you’ve got a few cold symptoms that are all “above the neck” then exercising should be OK. For instance, going for a walk or jog when you have a runny nose or a sore throat is perfectly fine, provided you listen to your body and don’t overdo it. If, however, you are suffering from more severe symptoms such as a fever, chills, all over body aches or extreme fatigue, then taking a rest day is vital to recovery. So what types of exercise are good when you have mild cold symptoms? The benefits to exercising when you are under the weather are improved circulation and better sleep, which can both lead to a faster recovery time. You’ll also enjoy the mental benefits that come with exercise such as a lift in your overall mood - great to help you get through these winter days. The key thing to remember is not to push too hard, and think about what kind of proximity you’ll have to other people. Things like yoga, walking, and even swimming which can help open up your airways, are all great options. On the other hand, lifting heavy weights or endurance running are likely to put too much stress on your body, and can worsen symptoms like sinus pressure and headaches. At the end of the day if you’re unsure, it’s best to consult your health professional. Especially if your symptoms hang around for more than a few days. Our everyday lives are now filled with technology: computers, tablets, smartphones and games.. All of these require us to be looking at a screen with our heads down. This constant position of being hunched over a device is causing a condition called “Text Neck” . It is a type of cervical spinal degeneration that can result from repetitive stress injury caused by the forward flexing of a head constantly looking down at a device screen. The human head typically weighs between 4 and 5 kg. This is not an insignificant amount of weight to be pulling down and forwards from the neck, sometimes for hours at at time. On average we spend up to 2.5 hours a day looking at smart devices, for work, entertainment and to socialise. So it’s no surprise that Text Neck is exceedingly common in lots of different types of people. What are the symptoms and effects of Text Neck? Pain in the upper back, it could be chronic, or sharp, or back spasms in the muscles. Some research has suggested that Text Neck can cause arthritis in the neck which can then develop into ongoing problems. If young, text neck may cause long-term damage to growing bodies, if not seen to by a professional and treated. The most important thing to remember with Text Neck is prevention. All devices including mobile phones should be at eye level, this is so you do not have to bend your neck to look down your screen. Where ever you have computers set up, in the office or at home, the screens should be organised so that your shoulders are square, with your head looking forward. If you can have regular breaks from your device, stretch your body, go for a walk, this may help to relieve any pressure or tension in the neck area. Your Core Muscles play a very important role in supporting your neck , a daily routine of specific exercises for your core will help strengthen not only the neck but your upper back as well. Read our recent post on Core Strength for more info. This is also needed for the neck muscles, there are specific exercises that will help keep the neck loose and strong to help support your head. The team at Dynamic Physio can help pin point any problems associated with Text Neck or any other related injuries. We can help you with a treatment plan to relieve pain and strengthen your body so Text Neck is no longer an issue. Contact us today to book an appointment with an expert therapist. Core strength and stability is one of the most important ways to prevent injury, and to make every day tasks easier. But what exactly does core strength entail? And how can we improve it? Your core is a lot more complex than just your visible abdominal muscles (the elusive “6 pack”). In fact, many of the muscles are hidden beneath the exterior musculature. The deeper muscles that are our true core muscles include the transverse abdominals, multifidus, diaphragm and the pelvic floor. The core has three dimensional depth and works in all directions of body movement. For this reason, there are literally hundreds of exercises that can be done to impact core strength. Your core is in place mainly to protect and hold your spine in the correct position through movement. It absorbs forces placed on the back instead of the passive structures such as your vertebral discs so as they do not wear out or get damaged. For example, if you were to lift a heavy object without engaging your core correctly, then your spine would take most of the force. However, performing the same action while engaging your core, although it may look the same externally, your core will actually absorb most of that weight and force, thus reducing the potentially damaging effects on the spine and other muscles. Think of it this way, your knee has muscle above and below it to absorb forces when you jump off something and land on the ground…without it your knee would most likely crumple. In this same way your core does the same thing for your pelvis, spine and upper body. A strong and stable core will allow you to push, pull, lift and bend with ease, while minimising injury. It will improve posture, and lift your performance in a number of different sports, as well as just normal day to day tasks such as picking up a child, carrying heavy objects or even doing the vacuuming! It is important to note that there are many, many core exercises that all have their merit, and the best recommendations will always come from a consult with your physiotherapist. Bend your elbows and rest your weight onto your forearms. Engage your core by contracting your pelvic floor and tightening your midsection. The Swiss ball roll out is slightly advanced but very effective. Don’t worry if you can only manage one to begin with. Slowly roll the ball forward on your elbows as far forward as you can handle. Return back to start position. Sit on the floor with your knees bent and feet just hovering off the floor. Lean back until you are at a comfortable but challenging angle for your abs. Keep your spine straight and not rounded. Twist your midsection from side to side whilst keeping your core active. Please note: These exercises are only a guide. A well trained Physiotherapist will be able to write a specially designed programme for you to be able to improve your core strength and stability. To find out more, book in with one of our therapists today. Most of us struggle with poor sleep from time to time, and with the recent hot weather it’s certainly become more of a problem for many people! You probably know some of the obvious ways to improve your sleep such as limiting caffeine and screen time, but there are a number of other strategies that can help you to increase the amount and quality of your shut-eye. With sleep, timing is everything. If you can it’s a good idea to try to get up and go to bed at the same time each day. It’s also been found that having a shower before bed can help you to drift off as the change in body temperature tells your hormones to get ready for sleep. Another key part of your routine should be to avoid using and watching screens too close to bed time. This affects your melatonin levels, which is the hormone that regulates our body clock. So put down your smart phone and read a book instead, perhaps. It has been proven that the endorphins released from exercise, as well as the associated fatigue, can assist in promoting sleep. Conversely, exercising (particularly anything high-impact) too close to bedtime can be detrimental as your body can struggle to relax and switch off from the stimulation. Getting into a regular exercise routine, whether walking the dog, playing a sport or attending the gym will assist in promoting your overall wellbeing, and the quality of your sleep. The modern Kiwi diet is unfortunately lacking in some nutrients due to the nature of our soil. A big one in terms of sleep quality is Magnesium. Taking one or two of these before bed can really assist with muscle relaxation and help you get to sleep. Talk to your doctor or pharmacist if you think that a Magnesium supplement could benefit you. It's also important for quality beauty rest and muscle repair that you are getting adequate Iron, as well as your B vitamins. If you are feeling sluggish a lot of the time, it's always best to check in with your GP to see if there's something else going on. Acupuncture has been used for centuries to treat all kinds of issues, and insomnia is no exception. Our resident Acupuncturist - James, is trained in both Eastern and Western techniques, and he can assist with a plan to help your body get back to normal sleep patterns. Talk to him today if you would like to find out more about how it works, and how Acupuncture could help you. No doubt you’ve started your year like most others, with a goal to start or stick to an exercise regime of some sort. That’s great! Making a commitment to improve your health and wellbeing is a great new year’s resolution to have. Sticking to your new routine can be challenging, so we’ve put together some tips below on how you can help make your resolution become your lifestyle. Do you want to lose weight? maybe you’d like to compete in a triathlon? Or just get back into team sports? What ever your goal, make it as specific as possible and set yourself a timeframe to complete it. Work backwards from your goal and break it into smaller milestones or achievements. Then enlist the help of an expert if you need, ask a personal trainer to create you a programme or talk to a nutritionist. Don’t beat yourself up if you fail to stick to your new routine 100% of the time. It’s perfectly natural to have good days and bad days, so try no to worry and remember tomorrow is a fresh opportunity! It’s much easier to stick to a commitment when other people are involved. Ask a friend or family member to join you in your new pursuit, that way you’ve got some moral support, and someone to share the fun with. You could also consider joining a club or a group training session. Remember to look back at how far you’ve come from time to time, it can be easy to forget why you started and how much progress you’ve made. Celebrate your achievements, no matter how small! Any new exercise regime comes with a risk of injury, so remember to listen to your body and don’t push yourself too hard initially. If you do start to experience pain or discomfort, book an appointment with your Physiotherapist who can assess and advise on the best course of action to prevent further injury and keep you moving. Are you super flexible, or have you been called “double jointed”? Joint Hypermobility is a condition where the soft tissue in the joints has too much elasticity and therefore allows the joint to extend beyond a normal range movement. The condition is typically inherited, and is fairly common. Being flexible has some obvious benefits, including a natural talent for gymnastics or ballet, but having hypermobile joints has some drawbacks as well when it comes to musculoskeletal injuries. Touch your thumb to your wrist? Straighten your arm beyond 180 degrees? Touch the floor without bending your knees? The graphic below shows a few other tests, called the “Beighton Score”, this is not conclusive but can give an indication if you may have this condition. So what does it mean if you have Joint Hypermobility? When connective tissue has too much elasticity, you're at risk of injury because your joints can easily hyper-extend, i.e. extend beyond their normal range of movement. This can lead to repetitive sprains, and even joint dislocations. If you have joint hypermobility, you need to focus on gaining more control of the movement around your joints. This control is gained through strengthening the surrounding muscles through controlled, functional movement. Exercises that focus on stability will help greatly, think: squats, lunges, balancing exercises, and planks. If you feel you might have hypermobile joints, it’s important to be proactive in keeping the muscles surrounding your joints nice and strong. If you experience recurring sprains in the same location (e.g. ankles), or you have any niggles that just won’t go away, chances are there is a weakness that needs to be addressed. A holistic physiotherapy programme could help to repair any damage and stabilise the area to prevent future injury. Come and see one of our experienced physiotherapists for a more thorough diagnosis and to make a plan. At Dynamic Physio it’s not secret that we love our hockey! But as our therapist Erin will tell you, hockey players are no strangers to the physio clinic. 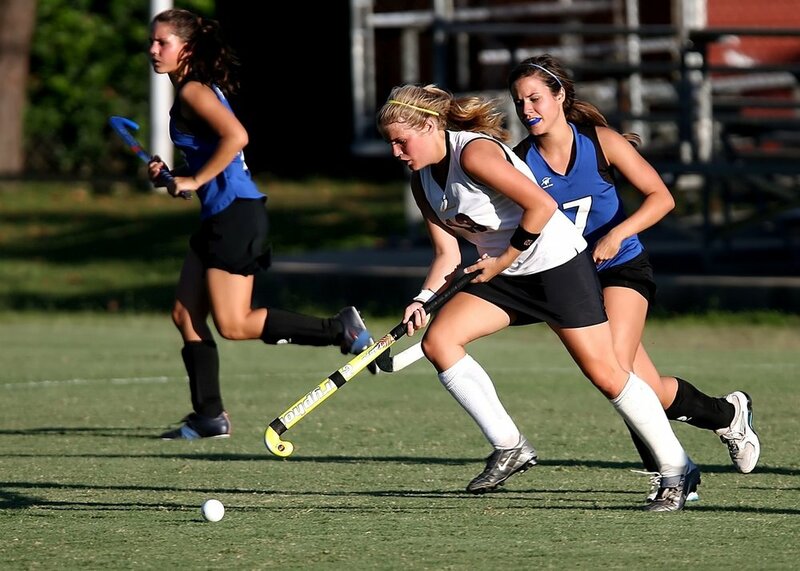 They often experience the knee and ankle injuries common to most sports, but in addition to this the nature of bending over to hold a hockey stick for extended periods can cause issues in the glutes, and lower back. Lower back pain is not just reserved for hockey players. Up to 80% of people will experience lower back pain at some stage. There are a multitude of causes and the pain can come on quickly, for instance through lifting a heavy object or twisting/jerking awkwardly, or gradually as a result of poor posture or an overuse injury. If you are suffering from this painful and often frustrating injury, there are a few treatment options that can help. You may start by treating the pain with paracetamol or ibuprofen, as well as a heat pack. Depending on the cause of the pain your physio can help get you moving again through soft tissue massage, acupuncture, and strengthening exercises to get you back to normal movement and prevent re-occurrence. These exercises will generally be focused around core stability, and helping you to sit, stand, move and bend correctly. Get in touch with the team at Dynamic Physio and we’ll put together a customised treatment plan to get you moving again. In this post we discuss the causes of tension headaches, how to prevent them, and how physiotherapy can help. Tension headaches are one of the most commonly experienced types of headaches in adults. They can cause pain in the head, neck and behind the eyes and are caused by contractions and tightness of the muscles in the head and neck. All headaches can be debilitating and affect your day to day activities. They can cause you to be tired and irritable, sensitive to light and noise, and they disrupt your sleep, work and exercise. If you experience regular tension headaches, your first reaction may be to reach for the paracetamol or ibuprofen. But painkillers are a temporary fix, and you are probably curious to know what’s causing your pain and what you can do to prevent and treat it more permanently. So what causes tension headaches? If you experience regular tension headaches, there may be underlying musculoskeletal issues or other factors that can be treated with physiotherapy and/or acupuncture. Physiotherapy treatment may involve joint mobilisation (stretching), soft tissue massage or postural taping. Acupuncture treatment is also regularly used to effectively treat headaches, and can assist in prevention of tension headaches by treating contributing factors like stress. For support and treatment of headaches and related issues, book an appointment with us today. We all know that sitting too much is bad for your health and wellbeing, and is a major contributor to Postural Syndrome (discussed in our series on What’s Causing Your Pain?). At Dynamic Physio we see a lot of clients who are suffering from aches and pains related to sitting at a desk for long period of time. If you sit at a computer for most of the day you may notice pain in your shoulders, back (upper/mid/lower), and neck towards the end of the day. You may also notice that you experience tension headaches, which can be caused by poor posture and sitting for long periods of time. Adapt gradually: don’t expect to transition from sitting for 8 hours a day to standing for a full 8 hours. Aim to start off with a couple of hours and build up from there. Wear comfortable/supportive shoes: it goes without saying, standing up for a long period of time in the wrong footwear can cause more harm than good. Don’t forget to move around: Although standing is better than sitting, intermittent walking breaks are even more important for your health. The bottom line: holding your body in any position for long periods of time is less than ideal and can lead to pain and injury. We all need to move more, and considering a standing desk for your workspace could be a nice way to help achieve this! If you have any questions about workplace posture, postural syndrome, or back/neck pain, don’t hesitate to talk to your physiotherapist. With Winter sport nearly upon us, and rugby specifically, we’re about to see a lift in the number of sports injuries we see at the Dynamic Physio clinic. The most common “start of the rugby season” injuries we see are knees and shoulders, mostly sprains and strains, along with dislocations. These injuries are typically caused by a heavy impact or an awkward fall. As a player, the best thing you can do to prevent a season-ruining injury in the first few weeks of the season is to ensure you warm up adequately, stretch regularly and focus on strengthening exercises to support your joints through the game. Try not in increase your training load too quickly, as this can cause unnecessary stress on your joints and soft tissue. If possible, ease into training and gradually build up the intensity. Cross training, stability and mobility exercises are your friends as well, as these help to support your body to keep moving correctly. You could try swimming, yoga or stretching. For help and advice on how to prepare your body and prevent rugby injuries, just ask your physiotherapist. We can put together a plan to ensure your body holds up for the duration of the rugby season. At Dynamic Physio we take a holistic approach to therapy: we focus on getting your body moving correctly so that you can avoid nasty injuries and enjoy life!